After America, Morrissey took the tour promoting his newest album "Years Of Refusal" to Ireland and the UK. Strategically, this leg of the tour coincided with the release of the latter album's second single, "Something Is Squeezing My Skull". Unfortunately Morrissey struggled with a cold throughout most of these dates. This led to the cancellation/rescheduling of this leg's bigger concerts, including five in London. Musicians: Boz Boorer (guitars, clarinet), Jesse Tobias (guitars), Matt Walker (drums), Solomon Walker (bass) and Kristopher Pooley (keyboards, accordion, trumpet and more). Morrissey played tambourine on a few songs. The bass drum had on its skin the spangly butterfly from the baby's head on the "Years Of Refusal" album artwork, until Morrissey reached Manchester when this was replaced by his name in the font used on the cover of the new album. Noise Is The Best Revenge, featuring Morrissey's nephew, played before Doll And The Kicks on the second Manchester date. -Blue women's t-shirt with Eiffel Tower and "I'm Throwing My Arms Around Paris", view. 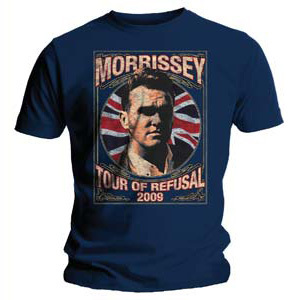 -Dark blue "Tour Of Refusal" t-shirt with Morrissey head over Union Jack background, view. 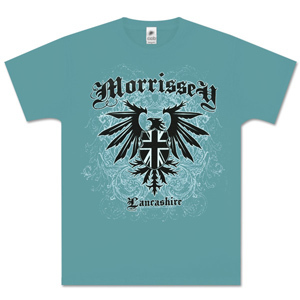 -Blue "Lancashire" t-shirt with coat-of-arms style Eagle with Union Jack, view. -Black 'Manchester' t-shirt, sold only in Manchester, view. 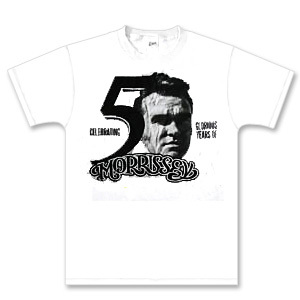 -White '50 Glorious Years Of Morrissey' t-shirt, sold only in Manchester, view front and back. -Signed and numbered lithographs of the "Years Of Refusal" front artwork, limited to 200, sold in Manchester only. The signed "Years Of Refusal" LPs were not sold everywhere, and the first place where they were available were in Stirling. Damien Dempsey - "Jar Song"
Doll & the Kicks - "I'm Throwing My Arms Around Paris"
Johnny Burnette - "Rockabilly Boogie"
-Sparks - "Lighten Up Morrissey"
-Shocking Blue - "Mighty Joe"
-Lypsinka - "The Telephone Routine"
Morrissey walked on stage at the end of an instrumental piano version of Nina Simone's "You'll Never Walk Alone". After the show, fans exited the venue to Frank Sinatra's "That's Life". 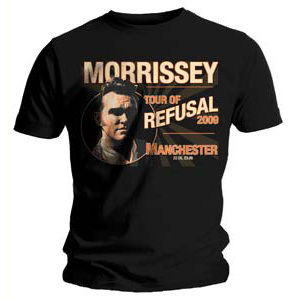 The sets on this second leg of the Tour Of Refusal were still mostly a mix of songs from the latest album "Years Of Refusal", 2004's "You Are The Quarry", and the Smiths catalogue. Surprisingly, nothing from 2006's "Ringleader Of The Tormentors" was played, and very little from Morrissey's early solo years. It's no surprise that the newest album "Years Of Refusal" was the most represented. "Black Cloud", "I'm Throwing My Arms Around Paris", "Something Is Squeezing My Skull", "I'm OK By Myself" and "When Last I Spoke To Carol" were played every night, or almost. "Sorry Doesn't Help" and "One Day Goodbye Will Be Farewell" were semi-regulars, and "Mama Lay Softly On The Riverbed" would often be on the setlist when the latter title was not. "All You Need Is Me" was played twice near the end of this leg. "That's How People Grow Up" was dropped altogether. "It's Not Your Birthday Anymore", which had been played only once before this leg, was expected on Morrissey's birthday or the next night, but it wasn't done. 2004's "You Are The Quarry" was surprisingly well represented. Each of the following songs was done every night: "How Can Anybody Possibly Know How I Feel? ", "Let Me Kiss You", "Irish Blood, English Heart" and standard encore "First Of The Gang To Die". "The World Is Full Of Crashing Bores" was done about 2 nights out of 3, on average. "Best Friend On The Payroll" was the honorary representative of the recently remastered and expanded edition of "Southpaw Grammar". It was played on most dates. "Vauxhall & I" supplied near-regular "Why Don't You Find Out For Yourself?" and part-timer "Billy Budd". Morrissey's early solo years were represented by regular "The Loop" and semi-regular "Seasick, Yet Still Docked". The Smiths catalogue supplied regulars or near-regulars "Ask", "How Soon Is Now? ", "Some Girls Are Bigger Than Others", "I Keep Mine Hidden", "Girlfriend In A Coma" and standard set opener "This Charming Man". The noisy "Death Of A Disco Dancer" was only done twice for variety. Before going into specific lyric changes, it must be said that Morrissey must have been going through an Elvis phase at this time because, besides quoting a few of his songs, he would sometimes sing a line (of his own songs) in an Elvis drawl. Something else that has been noticed is how he often punctuated lines in various songs with "thank God!" or "thank Christ! ", or extended them by adding "excuse me", such as "excuse me would you let me cry on your shoulder". Morrissey tends to improvise lyric changes in older numbers more often than in newer ones. So it's no surprise that the songs most transformed on these dates were "Ask" and "How Soon Is Now?". In the latter classic, the first occurrence of the line "of a shyness that is criminally vulgar" was rarely altered, but the second occurrence was usually changed to "...that is crippling and vulgar". For some reason Morrissey rarely made the change to "how can you say, I live my life the wrong way" anymore, on most nights he reverted to the studio version's "how can you say, I go about things the wrong way". The second occurrence of "I am the son and the heir" was now almost always changed to "I am the son, the son and heir". He usually replaced "you could meet somebody who really loves you" with "you could meet somebody who can even stand you". He usually followed the line "so you go on your own and you leave on your own" with a shout of "oh what a big surprise!". The change to "When you say it's gonna happen now, now! well, when exactly do you mean?" was always done. On a few occasions Morrissey reverted to the earlier change "see I've already waited too long and look at this face! all my hope is gone", but most of the time he sang "you see I've already waited too long and most of my life has gone". The studio version's final verse was still excluded from the live arrangement of the song. The other big transformation was with "Ask". In the song's first verse and its repeat, Morrissey now stuck to the original "from doing all the things in life that you like to" and stopped doing "from doing all the things in life that you want to". In the second verse he sang "from being all the things in life that you'd like to" on most nights, but also sometimes ended this with "...you'd want to". He often followed the first occurrence of "nature is a language, can't you read" with a shout of "NO!" and just as he did in the Smiths days he replaced the second occurrence with "nature is a language, can anybody read". Finally the change to "if it's not love, then it's military might, it's macho military might that will bring us together" was now standard. Now and then he would follow this with variations on "when you're ready, ask me, ask me, ask me" or "in the meantime, ask me, ask me, ask me". 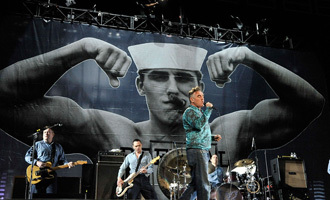 The recently introduced "This Charming Man", "I Keep Mine Hidden" and "Some Girls Are Bigger Than Others" were more transformed musically than lyrically, as they were all given a pub-rocky sound and "This Charming Man" was stripped of its jangle line. The only lyric change in the latter number was the one to "when the pleather runs smooth on the passenger seat", as Morrissey stopped doing "why pamper life's complexity". The only obvious change in "I Keep Mine Hidden" was the song's final line. Instead of singing "use your loaf" Morrissey would simply shout something improvised, and often undecipherable. He usually extended the line "force emotions to the fore" to something that sounded like "may force emotions to the fore" or "lay force emotions to the fore". The most interesting new lyric in "Some Girls Are Bigger Than Others" was its last verse. The song had only been done once by Morrissey with the Smiths and at the time he had added a new verse not found in the studio version (see here). Resurrecting it more than 20 years later, he dropped the song's second verse and chorus (the 'Anthony and Cleopatra' one), and playfully changed the new verse to "On the shop floor there's a calendar, and it's pointing out to you, one thing you never knew". He started changing "and I have just discovered" to "and you have just discovered". The other Smiths-era titles in the set were "Girfriend In A Coma" and "Death Of A Disco Dancer" and both were quite faithful to their studio counterpart. The only change in the former number was the very minor "let me whisper my last goodbyes". The crowd favourite "The Loop" was kept to its original form. Morrissey only changed "when you're bored" to "if you're bored", as he always does. "Seasick, Yet Still Docked" was also quite faithful to the original. 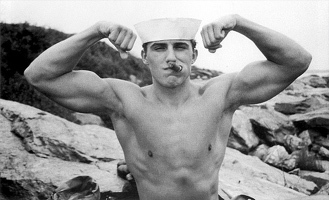 There were changes made in "Billy Budd", but no surprise. Morrissey stopped doing most of the previously heard changes in "Why Don't You Find Out For Yourself". The only one left was "what do you do, anyway!" and it was rarely done. In "Best Friend On The Payroll" Morrissey often changed the second consecutive occurrence of the line "it's not gonna work out" to "it's just not gonna work out", but not to "this is not gonna work out" much anymore. He would sometimes change one occurrence of the latter words near the end of the song to "how the hell can it work out". Morrissey completely messed up standard encore "First Of The Gang To Die" on most dates of the previous leg, as he paid more attention to the struggle between fans and security than to his singing. Fortunately for fans of this song, he stopped doing this on this leg. When he felt like it he still sometimes did the song as a medley with Big Dee Irwin's "Swinging On A Star". On a few nights he pulled out an old lyric change, the one that goes "the first lost lad to go - where else? - under the sod". There were very little changes left in "Irish Blood, English Heart". 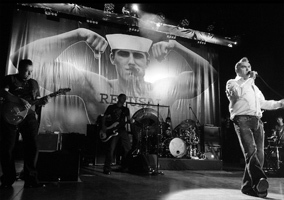 Morrissey stopped singing "you can see me standing by the flag not feeling shameful..." Now and then he would sing "never racist or partial" but on most nights he would stick to that line's original form. Every time he did the latter number he would add to its outro an improvised and undecipherable series of shouts (ed notes: has anyone ever been able to decipher anything?). Morrissey now always started "Let Me Kiss You" by singing "There's a place in the sun for anyone who has the nerve to chase one". He introduced a new common change to "I've zig-zagged all over the planet". He alternated between the studio version's "you'll try anything twice" and the change to "you'll try anyone twice". Of course he still always ended the song by ripping his shirt off and throwing it into the crowd following the line "and you see someone you physically despise". In "The World Is Full Of Crashing Bores", the previously heard change to "say a quick prayer 'cause he's still there" and the new change to "they who wish to crush you" were the only common ones. In "How Can Anybody Possibly Know How I Feel?" Morrissey started singing "the future is passing you by, I'm sorry but the future is passing you by". He still sometimes added emphasis to a few lines by singing "they say they respect me, me!" or "why? because you wear a uniform". The change to "everybody look, see pain and run away" was done on and off while the new "I would never be you, officer" was done every night. There were no surprises in the few performances of "All You Need Is Me". Morrissey sang "you roll your eyes up to the skies, trying to look horrified" and "you roll your eyes up to the skies, absolutely horrified". He still sang "all you can do is stand there and complain about me". For the benefit of the British public, he returned to the change "I was a small fat child in a council house". 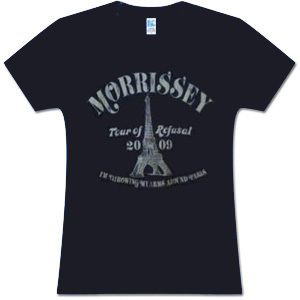 In "I'm Throwing My Arms Around Paris" Morrissey did not always change the line "I travel all over the place" anymore. He would sometimes improvise a change, such as "I ski all over the place", but most of the time he would stick to the recorded form. Now and then he would sing "in the absence of any kind of touch" but again, on most dates he would stick to the original form. In "Something Is Squeezing My Skull" he almost always changed the line "when you peel it back and bite me" to something different, such as "would you (please) peel it back and bite me", "somebody peel it back and bite me", "please peel it back and bite me" or "for God's sake peel it back and bite me". The only change left in "One Day Goodbye Will Be Farewell" was the one to "look at me I'm a savage beast". In "Sorry Doesn't Help" Morrissey almost always sang the very busy "you lied and then you lied about the lies that you lied about". He sometimes reversed the lines "sorry will not bring my teen years back to me" and "sorry will not bring my love into my arms". "Mama Lay Softly On The Riverbed" and "Black Cloud" were quite faithful to their original arrangements. In the latter number Morrissey usually sang "and I can sink even lower than usual". In "When Last I Spoke To Carol" he usually sang "I can't pretend life gets easier", "along life's narrow ledge", "across this ugly face of mine" (or "ugly mug" or "ugly mush") and replaced "something I always knew" with "something I still know" or "one thing I still know". They were no significant or regular changes made in "I'm OK By Myself". Nothing from these dates was ever featured on any official release. There is unfortunately no significant video souvenir of this leg of the Tour Of Refusal in circulation at this point in time. The best alternative collectors may hope to find are loose one-song video files being circulated on the internet. Collectors interested in this tour will have to do with bootlegs of the BBC Radio Theatre concert from the previous February, or concerts from the American and European legs that bookend this one. Fans and collectors interested in this portion of Morrissey's live itinerary have very little to choose from as there are only significant audio bootlegs of only three dates in common circulation at this point in time. 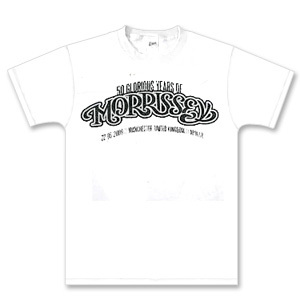 Of these, the most interesting option soundwise and performance-wise is undoubtedly Morrissey's 50th anniversary concert from 22 May. There are actually two known recordings of the latter date out there, but only one of them is commonly circulated. The good recording of the Cambridge show is a good alternative. It features "Mama Lay Softly On The Riverbed" which was not done in Manchester. The recording of the Hartlepool concert is the least appealing of the three right now. Its quality is slightly inferior, and the set didn't feature anything special. It will only appeal to completists and people who attended the show.